String wizardry extraordinaire. Take the top Celtic harpist in NZ (who also happens to be Principal harp with the Christchurch Symphony), add one of NZ's most versatile Celtic accompanists on guitar and bouzouki and you have a glorious instrumental combination, equally at home in a woolshed or a concert hall. Their repertoire ranges from the traditional music of Ireland and Scotland to newly composed material from NZ and elsewhere. In concert you can expect a varied selection of music - reels to polkas, airs to waltzes and, where appropriate, a few songs of definite Scottish accent. With the easy rapport that comes from 10 years playing together, they have enthralled audiences all round NZ and Australia. They completed a very succesful tour in early 2008 for Chamber Music NZ, including in their programme four pieces of new music from contemporary NZ composers which were specially commissioned for them. 2011 brought a return visit to the Australian National Folk Festival in Canberra as a featured overseas act, where they also tutored harp and bouzouki at the National Folk School. 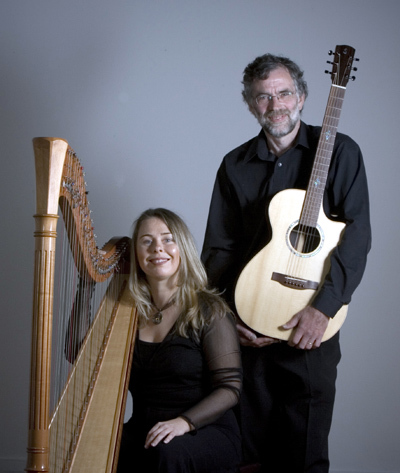 They released their first CD “The Peacock’s Dance - Celtic music for harp and guitar” at the end of 2001 and in 2010 released their much anticipated second CD, "The Golden Strand". This CD is a gem. These two musicians have worked together for years and it shows. The synthesis of their sounds and styles is wonderful to hear. One of the most beguiling effects in music is when the timbres of two instruments weave together until they almost can't be distinguished from one another -- and this is one of my favourite things about this album. The guitar and the harp come together beautifully in these lovely celtic tunes, some familiar, and some less so. There is a joyous sense of originality even in the well known melodies, with crisp and lively ornamentation and lilting phrases.